One of the best things to happen last year was seeing the UK and Ireland ACT/CBS conference take shape, and then finally run in November 2013. With over 200 delegates attending each day over the four days of the conference, it was gratifying to see the months of hard work by the conference committee pay off. 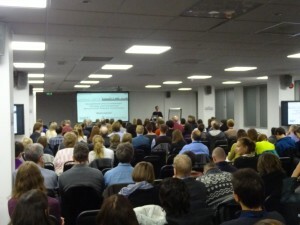 The conference had been a long-held goal of the BABCP ACT Special Interest Group. The SIG was formed by Mark Webster with 20 BABCP members following the 2006 ACT World Conference in London, and we “dared to dream” that one day we could host a conference. We hoped that this would strengthen the UK ACT community by encouraging home-grown research and clinical developments, and promote contextual behavioural science more broadly. Over the next 7 years we hosted events to build the community and ensured we had a presence at the BABCP national conference. In 2009 we got close to having a business plan approved by the BABCP for a proposed conference in Edinburgh, but were unsuccessful. We redoubled our efforts following this disappointment to put on successful events, that raised the profile of ACT and contextual behavioural science, and allowed the build up a surplus in the SIG bank account. Two events in London in particular contributed to this: the 2010 workshop with Steve Hayes (close to 200 delegates), and the 2011 “ACT Made Simple” workshop with Russ Harris (over 140 delegates). In October 2012 the SIG prepared another business plan for a conference, with Joe Oliver submitting this to the BABCP. To broaden the appeal and reach of the conference we approached Frank Bond, President of the ACBS UK and Ireland Chapter, with the idea of a jointly hosted event, which he fully supported. The time looked right: the ACT SIG had a healthy 1000+ members, a decent surplus, and a track record of well-organised events. A further factor that we thought strengthened our business plan was that the Association for Contextual Behavioral Science had planned for the next two World Conferences to be held outside Europe: in Australia (2013), and the US (2014). This would mean that there were no major conferences to compete with, giving the SIG conference a good chance of attracting UK, Irish and European delegates for a London event. As part of our preparations we sent out a “call for interest” email to the SIG membership and the ACBS, to produce a mailing list of people interested in the conference. This generated a response of around 250 people, mostly based in the UK. In the business plan we pitched the scale of the conference and basic structure: we hoped to attract 200 delegates across 4 days (2 days pre-con workshops, 2 days a multi stream scientific and applied conference; plus the Follies, a social event and tradition in CBS conferences). Thinking about the scale and structure, informed the expenses of invited speakers, venue, catering and marketing, to determine the anticipated cost per delegate. This cost per delegate then helped us to price student, early bird and standard delegate rates. The time of year for the conference was a challenging issue – the major events for the BABCP are the Spring workshops and the National Conference, we had to avoid scheduling against those. Similarly, not scheduling in the same month as the EABCT conference. This left us with an autumn/winter conference. This was also a challenge in terms of finding affordable venues in London for that time of year: university campuses were out, due to the teaching requirements of a busy term. It was looking pretty clear that we would need to host in a conference centre, which did increase the overall venue cost of the conference. We received the green light from the BABCP, who agreed to financially underwrite the entire conference! We formed a conference committee, with BABCP ACT SIG representatives (Joe Oliver, myself, Sue Hart, Henry Whitfield, Elizabeth Burnside, Martin Wilks) , the ACBT Chapter (Frank Bond), and Amy Donohue and Marie-Anne James from Eyas Limited (the event organising company). Joe as ACT SIG Chair, took on the role of the Conference Chair, while I agreed to be Programme Chair. Working with Eyas was essential: their experience in running the BABCP national conference meant that they could use their expertise to set up the conference website, scope for venues, establish costs for various conference expenses etc. 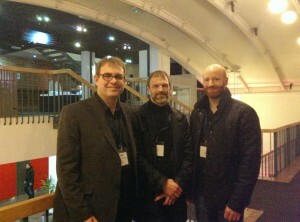 We met monthly to plan the conference, using a combination of face to face and online meetings, and email discussions. We received great support and advice from the BABCP, in particular Ian Preston (the Finance Manager) and Dr Stephen Gregson (the Communications Manager). Our first advertising in February 2013 for the conference may have seemed a little premature, but we had two aims 1) to alert people to the conference and encourage them to save the date/ plan ahead, and 2) to make the most of the end of the UK tax year, which sometimes results in training spends by employers. We advertised via email to BABCP members, Facebook groups for ACT, the UKACT listserv, and the international ACT listserv. From this first marketing we did receive a small number of registrations and plenty of interest from the community. Our call for submissions provided the next opportunity to advertise the conference. By this time we had confirmed our pre-conference workshop and keynote speakers, so as well as calling for submissions we could increase interest in the conference programme. The call for submissions had followed planning for the structure for the conference. We anticipated that most of the conference delegates would be practitioners (75%), with the remainder being researchers (25%). Similar to other ACT conferences this meant that we needed to program content that would appeal to the range of delegates (typically research symposia are less popular than skills classes). We came up five types of submissions: symposia, skills classes, open papers, panel discussions, and posters. We also confirmed the presenters for three half-day in-conference workshops (David Gillanders & Helen Bolderston; Niklas Törneke; Martin Brock & Chris Irons), which we hoped would be highly attractive to practitioners. The call for submissions was open for 6 weeks (closing end of May 2013): it was hard to judge the level of interest, and behind the scenes the committee encouraged people to submit the work they had been developing. We all knew of great speakers and interesting developments happening around the UK and Ireland, but would the community respond? Marketing a conference is a major task. From our experience of running events for the ACT SIG we knew we could use several no-cost channels: the international ACT listerv, Facebook groups, the UK ACT yahoo group, CBT Cafe, Twitter, and the London ACT networking events mailing list. I found that the tension with these channels is to make sure you get the message out about the conference, be responsive to queries, but not overuse the channel so that you are spamming(!). During this period we also decided where we were paying for advertising space – this included the BABCP magazine, inserts for the BABCP national conference and ACBS World Conference, and the British Psychological Society’s magazine. We set the close of the early bird rate for conference registration at the end of August 2013, which we hoped would give us a sense of numbers with two months to go before the conference. As Programme Chair my responsibility was to coordinate the conference content. Thankfully I was well-supported by the Programme Committee (Jo Lloyd, David Gillanders, and Louise McHugh), who evaluated the submissions with agreed criteria. This resulted in an overall ranking of the 71 submissions. Jo Lloyd and I also agreed upon content classifications of the submissions (e.g., health, psychosis, RFT, workplace etc). [It was brilliant to have so many RFT submissions, reflecting the research strength of our region, and meaning that this was a solid stream throughout the conference]. The standard of submissions was high, which led to some tough decisions when it came to the final programme. We probably had enough content to easily run a 3-day conference of high quality. As we did not have a sense of the registrations yet (early bird registration was yet to close), there was a decision to be made about whether we would have four or five concurrent streams of presentations. Five streams (adding space for 8 more sessions over two days) would mean an increased spend in terms of room space. Joe Oliver and I had several conversations about this, mindful of the financial risk involved. In the end we white-knuckled it; thankfully it paid off. Joe and I also planned out the structure and timings of the conference. As the committee’s goal with this conference was to maximise engagement of the community, highlighting the widest range of developments and greatest number of presenters, we decided to have each day begin and end with a 1 hour keynote, and contain four, 75 minute sessions. One hour and quarter is not long to present applied material or run a symposium: so the challenge for our speakers was to maximise their impact within this limitation. Responding back to people about their conference submissions was a busy couple of weeks for me. Perhaps not the most efficient way of doing it, I emailed every contributor about the outcome personally. This was fun to do with the people who had things accepted, much less fun when contacting people whose work did not get accepted. Where I could I suggested poster presentations as an alternative (which did bolster the poster session). Some people took the bad news with grace, some did not! (you know who you are). It certainly helped my perspective-taking with submitting things to conferences: someone, somewhere is sweating over what is accepted and what isn’t! Another reason to finalise the conference programme as early as we could was to be able to advertise the conference content to attract delegates. Again we received key support from the BABCP, with Stephen Gregson doing an excellent job in turning the raw material of the submission information into the conference programme. In the end the committee thought we had an excellent programme across the four days: would this engage the community and attract (enough) delegates? It was a good time to be practicing acceptance and mindfulness skills! The early bird deadline came and went: the response was promising, about 50% of our target. The committee decided to then extend the early bird registration period to the end of September, in an effort to boost registrations. This would mean that the full delegate rate would apply from October on. One of the unexpected tasks during this time was to remind speakers that they did have to register for the conference (45 or so people). This reminder did produce some “interesting” responses from a couple of people (again, you know who you are). Things were tight enough financially, without the committee giving away freebies! I had heard about this problem before, with the reminders at the BABCP national conference about the needing to register if you are speaker, but got a new appreciation of the issue from this perspective! Thankfully the reminders sorted things out. We didn’t let up on using the no-cost advertising during this period, and with weekly updates on the delegate numbers it really wasn’t until about 2 weeks before the conference that we had a reassuring number of registrations. Well, the conference happened. People showed up, and being an ACT conference, they showed up experientially too! The venue was lovely, the attentiveness of the staff was top notch, the food got great comments, and things ran smoothly. Many excellent presenters, cool research and developments, and keynotes that inspired. The committee kept hearing excellent feedback about the conference over the four days, it was a bit overwhelming! Credit where credit is due: our partners at Eyas really did a top-class job with the conference organisation. And, most importantly, the Follies rocked – showcasing British and Irish humour, ACT/CBS geekery, with some European craziness thrown in (you know who you are….). No doubt it is a lot of work to plan and run a conference, it was also a lot of fun too. I hope that this is the start of many CBS conferences in the UK and Ireland.